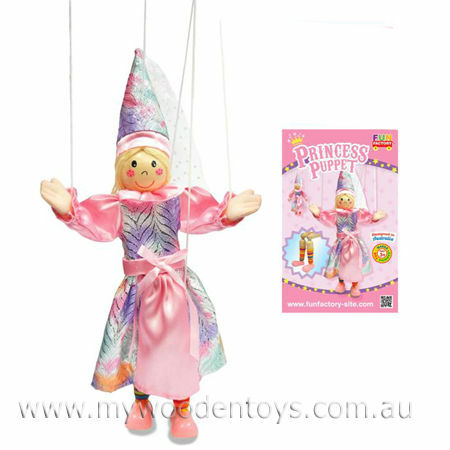 Puppet Marionette Princess is a beautiful pink princess with pink feet and stripy socks. This string puppet has five simple thick strings attached to a cross bar to control it and is nice and easy to use. This smiling princess has a lovely pointed hat and a colourful long dress. Puppets are a wonderful traditional toy and a great way to learn hand eye co-ordination. This marionette has jointed knees giving you many options for realistic operation. We like this because: "We love the stripy socks. "